A football loss dampened the Homecoming spirit for the Wooster football team and its alumni on Saturday evening after the Tigers of Wittenberg University shut the Scots out for the last three quarters in a 17-7 defeat. Despite cold weather, 3,456 people officially attended the annual rivalry game, and they were rewarded by the appearance of the sun for the first time all day. The game got off to a strange start that ultimately favored Wooster. After the Scots stopped Wittenberg at midfield, return man Girard Ogletree-Crawford ’13 muffed the punt, and the ball wound up in the Tigers’ hands again. On the first play following the turnover, Wittenberg quarterback Reed Florence threw an interception to Brandon James ’15 in the endzone. Richard Barnes ’14 then threw a pick on the first play of Wooster’s possession. The Tigers again failed to capitalize, missing a field goal from 41 yards out. The Scots put together a solid drive in response. Barnes rushed for 19 yards on the second play and completed all four of his passes, culminating in a six-yard touchdown strike to receiver Zack Weidrick ’13. Wooster’s defense forced another interception in the second quarter, this time by Rob Holtz ’13. This put the Scots in good territory, but Barnes fumbled after a sack to give the Tigers the ball again. Wittenberg managed to find itself with a first down on the one-yard line, but an impressive goal-line stand by the Scot defense kept them out of the endzone. After settling for a field goal, the Tigers trailed 7-3 at the half. Wooster put itself in a hole early in the third quarter. Pinned back at his own four-yard line, Jonathan Miller ’16 fumbled the ball into Wittenberg hands. The Tigers scored immediately on a three-yard pass from Florence to Desi Kirkman, giving them a 10-7 lead. 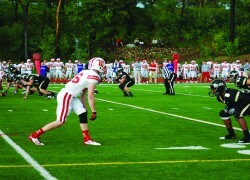 In the fourth quarter, Dana Obery ’13 kicked a career-long 70-yard punt, but the defense faltered on the ensuing drive. Wittenberg strung together a 13-play, 83-yard drive to make up for lost field position. Florence hit Garth Gilbert on a 12-yard touchdown pass to give his team a 17-7 lead. Facing a two-score deficit, the Fighting Scots put it in high gear with just over six minutes to play. Wooster drove all the way down to the Wittenberg 17-yard line, but an intentional grounding penalty put the Scots in 2nd-and-29. The Tigers put the nail in the coffin when Barnes’ pass was intercepted by Heath Eby. The loss puts Wooster at 1-2 on the season (0-1 NCAC). The team’s next two games will be on the road, starting with the quest to win back the Old Red Lantern from Denison University tomorrow.